Are You in the Realm of Totality? As I watched, a huge fish with whiskers, a catfish, came up to the surface, trying to eat the reflection of the moon. Of course it could not. Each time, as it bit at it, opening its mouth wide to devour it, the moon’s shimmering reflection disappeared. Jesus toyed with the catfish for a moment, moving the reflection of the moon around on the water, like a cat chasing a laser toy. The next thing I saw was the moon in the sky, in front of the sun. It was a total solar eclipse. I heard Jesus say it was a pearl. He actually held a large pearl with his thumb and forefinger up in front of him, eyeing it and lining it up with the eclipse; however, I knew He was talking about the moon. A map I had seen of the path of the eclipse over the United States flashed in front of me. I could clearly see the “path of totality” drawn out against the backdrop of this country. It was incredibly narrow, stretching from shore to shore. I could see the percentages of the eclipse that were to be visible at different points across the country: 80% in some places, 70% in others. Only in the path of totality is the eclipse fully visible. There were lines drawn across the map indicating these percentages, just like isobars on a weather map. I realized then that the sun was Him, and we are the moon! We are His pearl of great price! We are in between the Son and the earth (realm), reflecting the light of the Son! “Who, on finding a single pearl of great price, went and sold all he had and bought it” (Matthew 13:46 AMPC). The path of totality has everything to do with us as believers being “all-in” – we must be TOTALLY committed to the King and His Kingdom as well as our assignment in the earth. God has planted us in the realm of totality. The pathway where He has placed us is where we are supposed to be! It is a narrow path. We must stay on this narrow path in order to totally, fully complete our assignments in this new season. “But the gate is narrow (contracted by pressure) and the way is straitened and compressed that leads away to life, and few are those who find it” (Matthew 7:14 AMPC). In order to view this celestial event, we are required to wear special protective eye gear. In like manner we must also put on our special vision when we view the Son, lest we miss Him. “But blessed (happy, fortunate, and to be envied) are your eyes because they do see, and your ears because they do hear” (Matthew 13:16 AMPC). I find it humorous that Jesus used the catfish to illustrate the enemy. The Bible says, “Be sober, be vigilant; because your adversary the devil, as a roaring lion, walketh about, seeking whom he may devour” (1 Pet. 5:8 KJV). Jesus showed him to me not as a lion, but as a cat – and a cat-fish at that! His analogy of the enemy trying to bite a reflection, and Him (Jesus) playing with him like a cat with a laser just totally makes me laugh. You see, as the reflection of the Son, the enemy is doing just that – trying to devour us, His reflection. Of course he cannot, as this vision shows. Jesus simply “plays” him – He is the one that is in control. However, the catfish is biting, but it is a toothless bite, because catfish don’t have teeth! Regardless, he has lots of smoke and mirrors, and just because, “No weapon formed against you shall prosper…” (Isaiah 54:17 NKJV) doesn’t mean there won’t be any weapons. In fact, it means there WILL be weapons formed against you! The catfish was snapping at the reflection and trying to eat it, but Jesus just toyed with him. He was unsuccessful! He didn’t win! What God is illustrating through this vision is simply this: The enemy cannot harm you, nor can he stop you from acquiring your destiny! You are on the path of totality that God Almighty Himself has placed you on – you will see 100%. Yes, it is a narrow path, but so very well worth it, from beginning to end. You are of immense value to God! He gave His only son for you, and Jesus willingly laid down His life for you. You are His pearl of great price. Don’t let the enemy sell you a bill of goods that he cannot possibly ever deliver on! In the end, we still win! Author Edie BayerPosted on August 21, 2017 Categories UncategorizedLeave a comment on Are You in the Realm of Totality? “24 For this reason I am telling you, whatever you ask for in prayer, believe (trust and be confident) that it is granted to you, and you will [get it]. 25 And whenever you stand praying, if you have anything against anyone, forgive him and [a]let it drop (leave it, let it go), in order that your Father Who is in heaven may also forgive you your [own] failings and shortcomings and let them drop. 26 [b]But if you do not forgive, neither will your Father in heaven forgive your failings and shortcomings” (Mark 11:24-26, AMPC). As I read that passage, I realized that the Lord was giving me a key to getting my prayers answered. I asked Holy Spirit to reveal to me anybody that I had not as yet forgiven. For a few seconds, it was silent, and then I heard, “YOURSELF”. I was stunned! Hadn’t I already done that long ago? Regardless, I went into the filing cabinet in my heart, purposely searching for things for which I hadn’t forgiven myself. I started pulling out file after file, all of them empty, and then…I saw some folders that contained things that I had done wrong. The more I looked, the more I found! Suddenly, there were so many of them. The folders were overflowing with times that I had let other people down, times that I had missed the mark in so many areas. I started to feel really remorseful, full of regret. My entire body literally shook when He said that, and instantly I was catapulted into a vision. In it, I was holding a stick from a tree in front of me. It looked a little like a wooden stake at the end. Jesus was with me, slightly fuzzy and out of focus. He grabbed the pointed end of my stick and popped a marshmallow onto it. I then held the marshmallow over a campfire, and watched as it started to brown to that perfect, golden, toasted marshmallow color. However, instead of pulling it out and putting it in my mouth, I continued to hold the marshmallow over the fire. It turned black, caught fire and burned. Eventually it dropped off the stick into the campfire beneath it. That was all He showed me, but that was all I needed! And it’s all YOU need, too! You see, too many times we pull that marshmallow of “unforgiveness” off and stick it back in our mouths, ingesting it once again. The enemy is altogether too happy to come along and feed us his lies over and over again. He will remind us of our wrong doings and shortcomings just as many times as we’ll buy into them, eating them up. 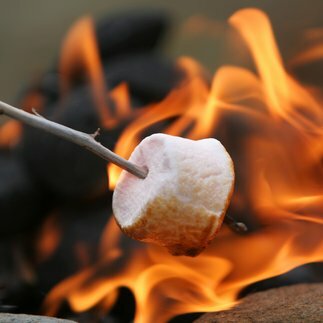 In this vision, the Lord showed me that this marshmallow was ROASTED and BURNED UP in the fires of purification through which I, and many others in the body of Christ, have gone – allowing it to DROP off my stick into the fire. You see, the part of the scriptures above that most of us understand is to FORGIVE; however, we simply don’t follow all the way through and allow the matter to DROP completely. Sometimes we hold a grudge; others, we “say” we forgive, but really do not. Other times, the unforgiveness simply gets buried somewhere in the “filing cabinet” of our hearts. This allows it to resurface at some point down the road. In the vision, and in my heart, this time the marshmallow fell off the stick, dropped into the fire, and was burned up. So was my unforgiveness toward myself dropped into the flames, consumed forever by His fiery love. “29 For our God [is indeed] a consuming fire” (Hebrews 12:29, AMPC). The moral of the story is this: The next time the enemy comes to feed you your past transgressions – which incidentally, have already been forgiven (see Ephesians 1:7) — and tries to stir up unforgiveness inside, don’t swallow his lies. Instead, give yourself a marshmallow! Just remember to let it drop.